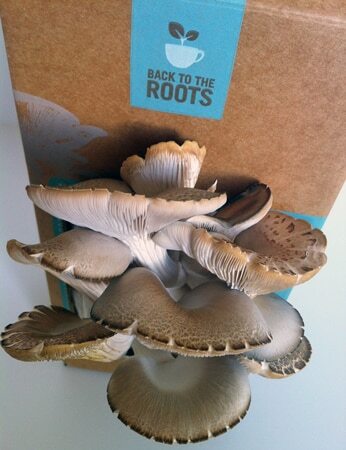 After reading about Back to the Roots mushroom growing kits on several blogs, I decided to buy one when they were offered as a deal on Heartsy. Having had so little luck in my square foot gardening efforts, I figured that I’d try my hand at growing mushrooms. Mushrooms grow on trees! They grow on our lawn after rain! Mushrooms are everywhere! You can’t not grow mushrooms! Well, yes and no. I managed to get two crops out of my mushroom kit, but they were a little bit stunted because the first crop came when the air conditioning was on and the second was when we started turning on the heat. Mushrooms need dampness and even with my obsessive misting, the mushrooms kind of dried out (as you can see in the picture below). Bummer. But still, I got some oyster mushrooms out of the deal, so that was awesome. This is what I made with my second crop–Wild Mushroom Fettuccine with Smoked Apple Sage Sausage. 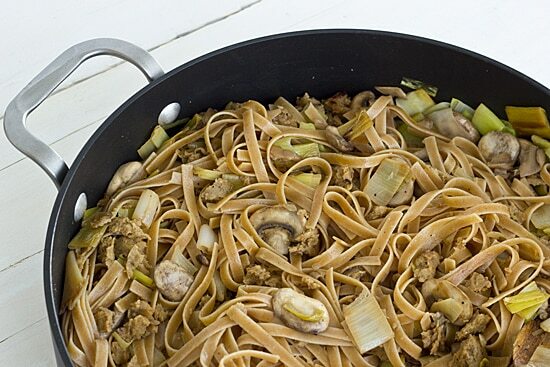 Earthy mushrooms meet sweet-and-savory vegan sausage and wine-braised leeks–delicious! Feel free to substitute any kind of mushrooms or sausage that you like. Heat oil in a large skillet over medium-high heat. Add leeks and 1/4 c. wine. Cover and cook 7-8 minutes. Add mushrooms and remaining wine. Cook about 8 minutes more, stirring frequently, until mushrooms are just beginning to brown. Add crumbled sausage to pan and cook 2-3 more minutes. Add fettucini to pan and toss. Season with salt and pepper. I’m drooling…… also very impressed you grew mushrooms! Fingers crossed I can grow some too!! Are you growing them from a kit? I’ve seen ones for shiitakes too and they’re calling my name, but I’m going to wait until the spring. It’s probably cheaper to buy them, but not nearly as much fun! This looks so good. I love mushrooms fresh or cooked. I love cooked mushrooms, but I have never liked them raw. Have you tried roasting mushrooms? They are great like that! I have never tried to grow them but remember in Poland that there were several farms near my grandmother’s farm that did. They were cinder-blocked, dark and moist greenhouses. I remember going to sneak a taste every now and then 🙂 We also went mushroom picking in the local forests. Now I want a cinder-block mushroom farm in my backyard!!! We picked them in the woods of Michigan when I lived up north. This sounds so good and perfect for fall! The mushrooms looks so pretty, it’s a shame they weren’t very good. The mushrooms were really good–I just couldn’t get them to grow very big because they started drying out on the edges. Oh how impressive!! This looks so amazing! Oh mah gawd. I am totally going to get a mushroom kit now!!! Ha, I totally know how that goes. Thanks for linking up! Ha! I had that thought too, but at least with oyster mushrooms, they have such an obvious shape that you know you haven’t grown something poisonous. 🙂 Now, foraging for mushrooms, I just KNOW I would pick the wrong ones!